Welcome to the Katmai National Park Information Page. There is no road access to Katmai National Park except from King Salmon. The dirt road from King Salmon goes to Lake Camp at the edge of the park. Lake Camp provides access to boats for Naknek Lake and Brooks Camp. The only other road in Katmai National Park and Preserve is the road from Brooks Camp to the Valley of 10,000 Smokes. It is a 23 mile dirt road, that makes three river crossings before reaching Three Forks cabin offering a view of the Valley of 10,000 Smokes. Visitors can take advantage of the daily bus tour offered by the concession from Brooks Camp. Daily commercial flights operate between Anchorage and King Salmon. Charters air taxis and boat tours are available from King Salmon, Anchorage, Homer and Kodiak. Scheduled service into Brooks Camp is available from King Salmon by float plane and boat. Many area lodges provide their own transportation to the park. Capsicum bear spray is not allowed on commercial airlines. Bear spray should not be taken within the cabins of air taxis. Let your pilot know if you are carrying bear spray so it can be placed in the floats of the plane. Access to the park and preserve is by aircraft (float planes generally land on Naknek Lake), and by boat or ship. Snow machines can be used in deep winter during some years when temperatures are sufficiently low to form thick ice. King Salmon is the nearest local community. The majority of visitors come from early June through mid September. 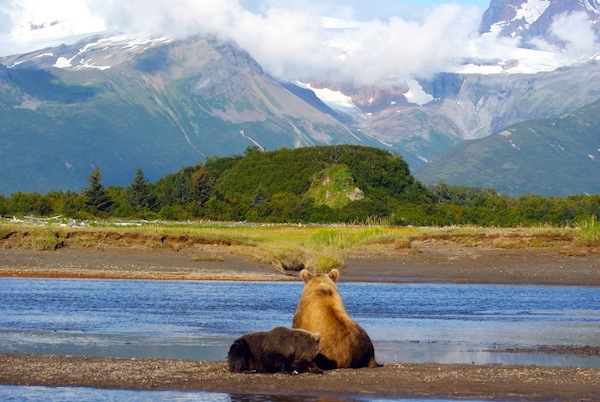 Among all this diversity, Katmai National Park and Preserve is famous for its brown bears and fish populations. Bristol Bay streams, including the Naknek River, are the source of some of the world’s largest salmon runs and appear to have been so for about the last 4000 years. Trophy-size game fish such as trout inhabit many of the park and preserve streams. The bear come to feed on the fish, sometimes in unusually large concentrations. There is a migratory caribou herd and it appears that in the past there was a more regular presence – enough so that hunting caribou was a regular aboriginal activity. Overall, Katmai National Park and Preserve contains at least 29 species of land animals, 6 of sea mammals, 150 species of birds, and 28 of fish, as well as uncounted intertidal and coastal species. Bear viewing at Brooks Camp is best in July and September. There are few bears in August, though they still are seen occasionally. July and September are crowded, expect waits and time limits when going to the Brooks Falls Platform in July. Weather and bears are always a factor at Katmai National Park and Preserve so plan extra time to work around delays. You may camp anywhere in the park, but for backcountry camping, please obtain a permit from the Brooks Camp Visitor Center or park headquarters in King Salmon. There is one campground available, the Brooks Camp Campground. There will be a $10.00 per person per day user fee at Brooks Camp. Visitors spending the night will pay on a per night basis; those visiting just for the day will pay by the day. For example, a lodge guest or camper staying four nights, will pay $40.00 in user fees even though they will actually be staying at Brooks Camp for five days. A single day visit will cost $10.00. In addition, there will be a $5.00 per person per night camping fee. Katmai is one of the greatest fly fishing spots in Alaska. An Alaska fishing license is required for fishing; and all state rules apply. Meals are served at Brooks Lodge and are available for all visitors to Brooks Camp. Brooks Lodge Trading Post sells white gas, fishing gear, some snack foods, souvenirs, and other limited supplies. Katmai is a vast wilderness of deep, cold lakes, long scenic valleys, volcanic landscapes, and a diverse seacoast. Located at the northern end of the Alaska Peninsula, this rugged country offers opportunities for long crosscountry backpack trips or short day hikes. Boaters can canoe, float or kayak lakes, rivers and streams in Katmai. With adequate preparation, proper equipment and certain skills and knowledge, the hiker can have a safe, memorable experience. Meals and accommodations are also available at King Salmon and at other private lodges. Reservations are taken for Brooks Campground and Brooks Camp Use Permits. Use permits are required for all visitors that come to Brooks Camp. Pets are allowed in Katmai National Park and Preserve with one exception. Pets are not permitted at Brooks Camp, or within 5 miles of Brook Camp, because of the high visitor use and concentration of bears. Bears and pets generally do not tolerate each other. A variety of interpretive programs are available at Brooks Camp throughout the summer. Evening slide programs are presented nightly by interpretive rangers. Ranger led cultural walks to an archeological site are conducted each afternoon. Other walks and programs may be offered during August. King Salmon Visitor Center is located next to the airport terminal in King Salmon. It is operated by the US Fish and Wildlife Service, with a partnership with the National Park Service, Bristol Bay Borough, and Lake and Pen Borough. The visitor center has exhibits of the local area as well as interpreters that will provide information on the entire Katmai National Park and Preserve region. Bear resistant canisters are available at the King Salmon Visitor Center for those planning to use the backcountry. Brooks Camp Visitor Center is open early June to mid September. There all visitors attend the Brooks Camp Bear Etiquette School to learn how to behave around bears. This includes watching the Brooks Bear Orientation video. Books, cards, and posters are sold at the Visitor Center. Bear resistant canisters are available at the Brooks Camp Visitor Center for those planning to use the backcountry. Summer temperatures are usually about 60 F. Cool, overcast days, with strong winds are common. Be prepared for cold rainy weather as well as some warm, sunny days. Spring and fall temperatures are cool with cold nights. Winters are cold with about six hours of sunlight.